We had the opportunity to review the Family Subscription to Live Violin Classes from Practice Monkeys. I grew up playing the clarinet, piano and flute. Discipline, an appreciation for music and musical skills are what I gained. Those are all abilities I want my children to have. So far, I have two guitar players, one flute player, one ukulele player, one piano player and two violin players. I think we have done well in the music department in our school. My children have also gained those abilities through their instrument playing. When we closed the 2018 Homeschool Review Crew season, Lily was in the middle of reviewing Practice Monkeys. I was happy to learn, and so was she, our review period was continuing through the Christmas holiday and into the New Year. 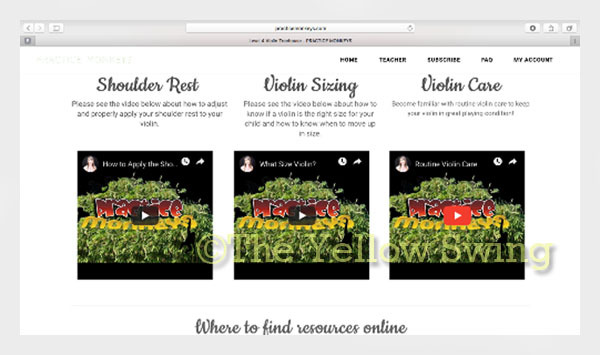 Practice Monkeys is an online program with live violin classes taught by Sarah Van Kleeck. The lessons are brought to you live via an iPad or computer (or other app capable device) with the download of the Zoom app. Students attend four scheduled live classes for 47 weeks and/or have access to watch recordings of the classes if they are unable to attend. You may conveniently watch the classes in the comfort of your home or take them with you wherever you go and have Internet connection. • 47 weeks of Live Instructor-Guided Practice Classes per year. Class recordings are available all 52 weeks. The program was created for students as young as three years old through the age of 99, but I am certain even someone older (100 years old 😉 ) would enjoy the program too! 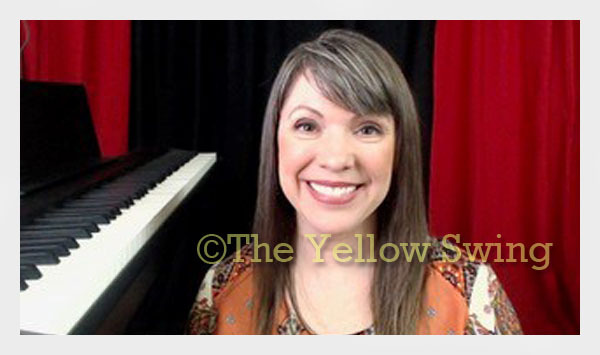 Sarah Van Kleeck is the creator of Practice Monkeys and has more than 25 years of experience teaching Suzuki Violin. She has a warm and friendly demeanor and presents the program in a manner that is easy for all ages to understand. Lily was the only student this time around and I wish I had added River and myself in the classroom. With the Family Subscription to Live Violin Classes, your entire family may attend classes and learn how to play the violin. Before Lily started the program, she made a reservation for an assessment. 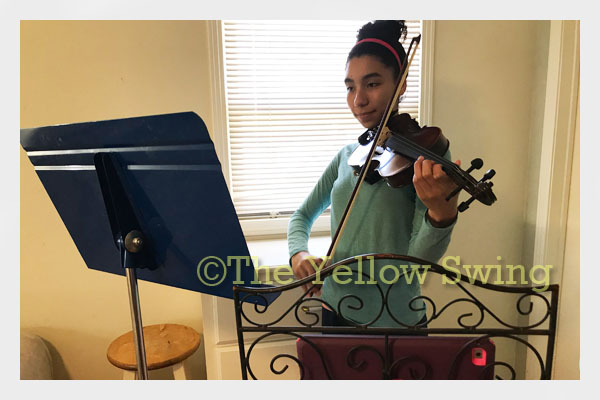 Although she has already had some private lessons and plays violin in an orchestra, it was good for her to be assessed before starting. The assessment was about 45 minutes and extremely thorough. A checklist is available before the assessments, so the student knows what is expected of them. After the assessment, Ms. Van Kleeck placed Lily in Level 4. Ms. Van Kleeck also ordered Lily’s music book, which arrived the following Monday (very quickly), so she was able to immediately start classes. The class placement was a good fit for Lily. Her scheduled class was held from 4:40 p.m. to 5 p.m. CST, four days a week, Monday through Thursday. All of the structured classes occur between 3 p.m. and 7 p.m. EST. Students are encouraged to attend class/practice four times a week with two additional days of them playing (practicing) music of their choice. After just a few weeks, Lily completed an assessment and was promoted to Level Seven. There were some days she had to miss class due to flute lessons and orchestra, and volleyball practices. We have no shortage of extra-curricular and driving all over the place. Although she hated missing class, Lily did not fall behind, because she was able to view the recorded classes for the days she missed. All of the recorded classes are available to students in the Practice Monkeys Treehouse. The Treehouse is like an online notebook or binder of most everything the student needs for class. It includes recordings of the classes, videos of tips, skill techniques and more. There are resources like practice, assessment and scale sheets, fun worksheets and booklets (memory books) of exercises that help reinforce the learning (ex: drawing pictures of performance, note structure, student playing the violin, handwriting practice and more). Depending on the age of your child, they may be able to complete the Practice and Listening record for their level, which helps the student keep track of their weekly progress. Ms. Van Kleeck also offers a Help Class on Saturdays for students who need additional assistance with the material covered in the classes. Although Ms. Van Kleeck is the primary teacher, parent involvement is part of the Practice Monkeys experience. Ms. Van Kleeck makes it easy for the parent whose responsibility is to oversee as their child participates in the program. Parents may purchase an assessment once their child has completed a level (or before if they are ready) and is ready to be promoted. Ms. Van Kleeck includes a comprehensive list of what the student is expected to know to successfully pass the assessment. This is one of the songs Lily learned in class. Finding a capable, qualified and affordable music instructor is difficult, especially when you live far away from everything. My children currently take music lessons (flute, guitar and violin) with a round-trip commute of 1 ½ hours, plus the almost three hours away from home while at lessons. Although it is once a week, that is still a lot of time away from home and a good chunk of our day. I enjoyed the convenience of Lily taking music lessons at home, just around the corner in the next room. Once the lesson was over, we were able to quickly move on to another important task instead of climbing into our car for the drive home. Despite the belief, homeschoolers are busy people! Having a professional music instructor come to (come into) our home for music lessons is a big deal. I can tell a lot of thought went into creating Practice Monkeys. The website is extremely well laid out and organized. 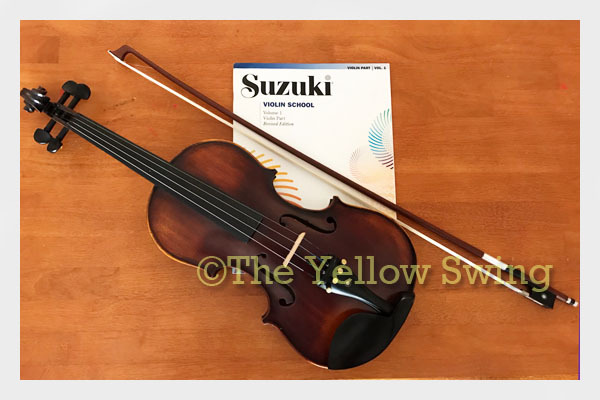 There is information about everything you would want to know about playing the violin and everything before and after that. The live violin classes are thorough and seeing Lily’s progress proves an online format for instrument instruction can have good results. I think her previous experience playing the violin was beneficial. I like the fact classes are held four days a week and that Ms. Van Kleeck offers a Help Class. I do wish the weekly classes were longer than 20 minutes. There is not as much teacher-student time, especially when there are multiple students in the class. Also, for a beginning student, I prefer hands-on (in person) instruction. I think instrument and bow placement is important and sometimes techniques like those may not translate easily via video. I do love and appreciate Ms. Van Kleeck’s enthusiasm every day she taught class. The classes are lively and she is very much engaged with the students in her class. Ms. Van Kleeck makes learning how to play the violin fun! You have the opportunity to try the Practice Monkeys program for free. If your child has an interest in learning how to play the violin, I highly suggest you let them do the free trial of Practice Monkeys to see if the live violin classes are a good fit. 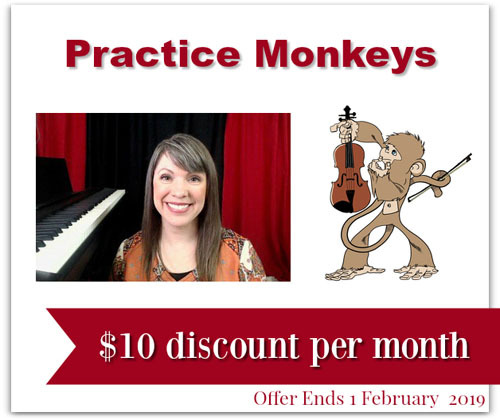 Take note that you can save $10 on the monthly Practice Monkeys program through Friday, February 1, 2019. A Piano course through Practice Monkeys is also offered with that special pricing. ”Purchase our regular monthly subscription at our Year-One Pricing! 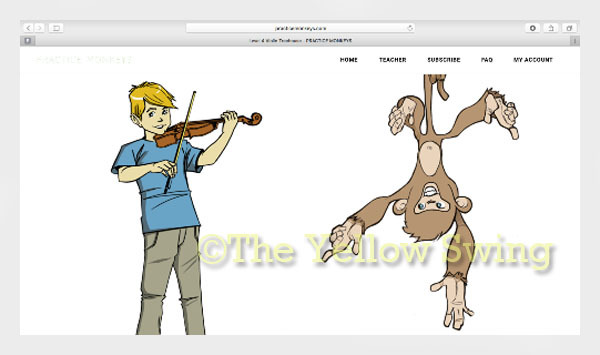 You may purchase the Practice Monkeys Family Subscription to Live Violin Classes for $49 a month.